Yasodhara Yoga Teachers & Centres (YYTC) offer the teachings of Swami Sivananda Radha. Trained at Yasodhara Ashram, we are committed to living the teachings of yoga and bringing forth the best in ourselves and our students. Ours is a practical philosophy of teaching and learning, with classes designed to create an atmosphere of self-directed learning and discovery. We encourage an experiential approach to yoga. Classes focus on developing character and quality in life, and may include gentle Hatha Yoga, Hidden Language Hatha Yoga, Dream Yoga and Kundalini Yoga. Special Yasodhara Yoga workshops are also presented by local teachers or by touring teachers from Yasodhara Ashram. Read more about Yasodhara Yoga. We understand that not everyone can easily access Yasodhara Ashram, our spiritual home, which is located in a remote area of British Columbia. 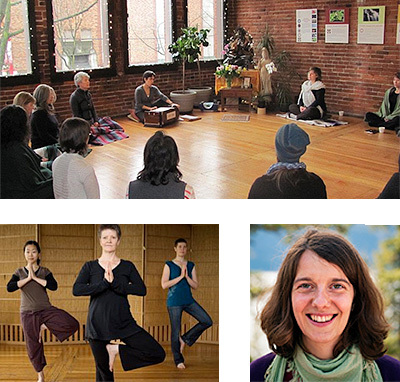 Yasodhara Yoga Teachers & Centres are a worldwide network that represent Yasodhara Ashram in local communities. In some locations our teachers function from long-established centres or yoga studios. Often we are clusters of teachers who join together to offer weekly classes in various venues throughout a city. Or a single teacher may be dedicated to sharing the Yasodhara Yoga teachings at her local community centre. Many of us offer yoga outreach to youth at risk and seniors, and we have a special interest in the health and healing community. We teach where our hearts lead us and where the needs are. We offer yoga classes as selfless service. Class fees are contributed back to either support projects at the local centre or at Yasodhara Ashram.